Глубоководная Рыбалка в Коста Рике на Тихом Океане – Это незабываемое путешествие и Рыбалка в Открытом Океане. 8 часов. роскошное приготовления улова на берегу океана. Costa Rica has some of the best Sport Fishing in the world. The Pacific side has incredible fishing for Sailfish, Marlin, Dorado, Tuna, Wahoo, Roosterfish, Snapper, and more. The Caribbean side and Northern regions of Costa Rica are famous for big Tarpon and big Snook. 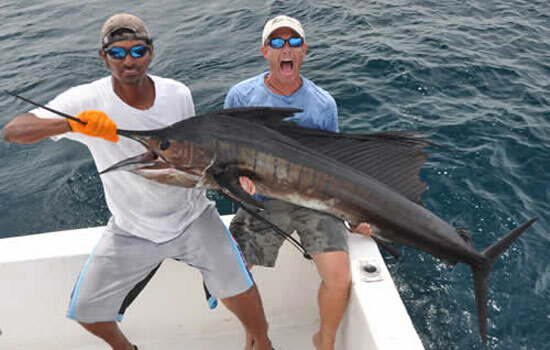 Costa Rica is quickly becoming the destination of choice among serious sports fishermen. Rocky shorelines and islands make for the perfect hideout of roosterfish & wahoo, and the Pacific Ocean is home to some of the largest numbers of billfish anywhere. Numerous sports magazines, adventure shows and ESPN have come to Costa Rica to see the world record tarpon, abundant billfish and year round excellent inshore fishing.